Since most people visit Ketchican by cruise ship, this will help you enjoy your short stay in the "Salmon capital of the World"...think "Dangerous Catch". 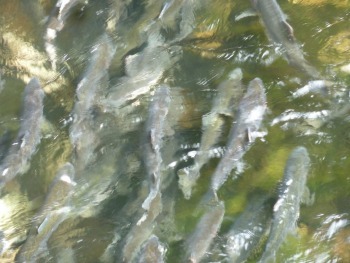 When we say there are many salmon this is an overhead shot in downtown Ketchikan of salmon returning from the sea to lay their eggs...then they die. They spend several years at sea where they gain their weight and get ready for the last phase of their life. They go as far as 750 miles upstream to lay their eggs where they were spawned. So these fish have just started a long journey of rapids, predators... like bears, eagles and hawks. How they know where to return to is one of nature's mysteries. Very few make it all the way...most end up as fuel for bears to hibernate, during the long Alaskan winter. The bears will add up to 30% to 40% of their bodyweight prior to hibernation...mostly at the expense of the salmon who are trying to reach the place of their birth. It is almost like fishing at a hatchery...eventually you will catch a fish. 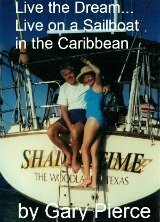 When you do get off the ship...be prepared for some rain. Ketchikan gets about 140 inches per year, so bring rain gear...if you forget the many tourist shops will be glad to sell you something to keep dry. Rainy days are not all lost ...for things to do in Ketchikan here is the official site. You may want to use this link above for realistic weather forecasts...it could be pouring and the ship would forecast partly cloudy...they want happy passengers, no sense giving them a glum weather forecast. Ketchikan is usually the first stop for northbound ships on the inside passage route to Alaska. It also offers a lot to do for the non-frugal Ketchikan passengers, float planes are constantly taking off and landing by the ship...their are also helicopter tours for those not on a budget. 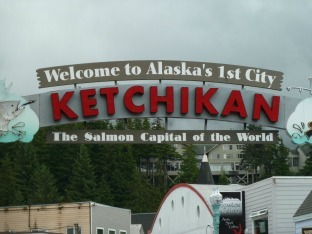 Ketchikan offers something for every cruise ship passenger...Enjoy beautiful Alaska. Come along and benefit from our 20 years of being happily retired.